Georgia is a two-year-old female Boxer who was adopted a few days ago by a family in Beverlywood California. Her new guardians set up a dog behavior session with me after seeing her play too roughly with their other dog, one-year-old Poodle mix Tanner; pinning him down with her paws. The family also asked me to help Tanner learn to come when called and not run out the front door. I quickly found out that these dogs live in a very active home. The family has several young children and their home is base for them to hang out with their friends. An active house can be more challenging for some people, but not this dog trainer. Georgia was out front when I arrived and seemed very at ease with the group of kids playing in the front yard. Georgia was pretty subdued for a Boxer her age; they are usually quite boisterous and animated. But Georgia was calm and cool as she mingled with the kids on a leash. We headed upstairs to start the session away from the kids running in and out the front door to the home. Once there, I was able to observe Georgia and Tanner interacting. Tanner did not show any hesitation in his movements or display any body language that communicated that he was uncomfortable around her; laying down on the floor a few feet away with his back to Georgia. The family was most concerned by a few incidents where they saw Georgia pin Tanner down. Often times inexperienced dog guardians can be confused by heavy play; thinking it is a fight when it is actually play fighting. Based on our conversation and how the dogs were acting around one another, it sounded like this was a case of play that got carried away. Not knowing Georgia’s background, she may not have much experience playing with other dogs, especially small ones. Sometimes it takes dogs a few play sessions together to learn how much is too much. I suggested that the guardians do not allow the dogs to play together unsupervised for the next few weeks. Its important that they spend time together, but we obviously want to make sure everyone stays safe. Later in the session I did see a play session get a little intense and one time when Tanner was running by Georgia unexpectedly, she snapped to attention almost in hunting mode. These are times when the guardians will need to intercede and add structure making the dogs take a short time out. I advised the guardians to pay the most attention when the dogs are playing, over excited, or when there is a lot going on in the room. These are times when the dogs are most likely to get into any altercations. To help the guardians know what to look for, I spent a few minutes going over some body language tips and signs that may indicate things are heading in the wrong direction. 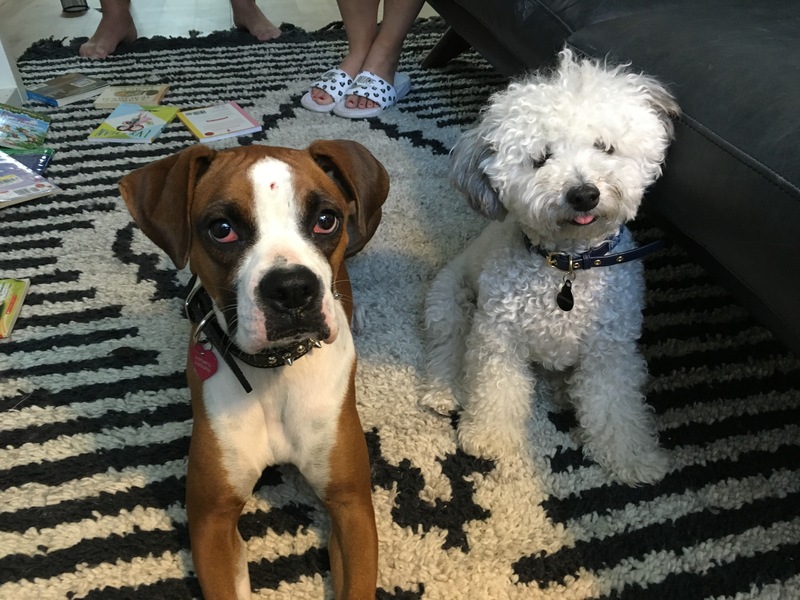 By observing the dogs and watching for these signs, we can help Georgia and Tanner get into a habit of hanging out without incident. Human and Canine neuropathways get covered by something called a Myelin Sheath when we practice or repeat the same action over and over. This is why we tend to drive to work the same way every day even though there are many paths we can take. By simply being together without any altercations for a long enough period of time, we can help the dogs establish a nice balanced relationship that should continue. I also pointed out that Georgia’s behavior may change as she gets comfortable in her new home. Often a dog is a little reserved for a few days when adjusting to a new environment so its possible the laid back energy Georgia was showing may intensify a bit. If that happens, I suggested that the guardians employ a dog walker early in the day. The expression a tired dog is a good one is quite accurate. When you have one dog, you can often get away without a lot of rules and structure. But when you have more than one, they often compete with one another for position. Additionally, a lack of rules can easily give the dog the impression it has the same authority as the humans they live with. If a dog thinks it has the same authority, then listening and obeying become optional. To ensure the dogs see and respect their humans as authority figures, I suggested that the humans start to incorporate some simple rules and boundaries. These rules and limits will help the dogs start to see themselves as followers and increase their respect for their humans. This will be important as dogs who do not respect their humans do not listen to them unless they want to. I have found that adding a little structure to every day and repeatable tasks goes a long ways towards helping the dogs move into a follower’s mindset. By adding a little twist to these every day activities that we repeat all the time, we can train our dogs without even thinking about it. I have found that one of the easiest twists that delivers the best results is to pet your dogs with a purpose. It will be a challenge at first to get all the kids that live there and visit to refrain from petting the dogs without a reason. I suggested that the parents explain to the kids that petting our dogs is how we say “thank you.” It will take some monitoring and effort, but if everyone is keeping an eye on it, the family should be able to get into this new habit within a week or two. Next I went over a series of escalating consequences that the humans can use to disagree with the dogs if they break the new rules or do something they do not want; like rushing the door when someone knocks. After explaining how the consequences work, we headed downstairs so I could show the family how to use them to keep Tanner and Georgia away from the door when anyone rings the door bell. I suggested that the guardians lay down some painter’s tape about ten feet from the door so that its easy for the humans and dogs to know exactly where the boundary is. Although its not difficult, the exercise looks easier than it is. Timing and deliberate movements are extremely important so we had a few of the kids head outside to play the part of a guest so that the guardians could answer the door on their own. I would prefer to see the guardian move with more deliberate movements and pausing between each pair of steps. This gives you an opportunity to make sure that the dog stays in place. The guardian will also need to keep her hips facing the dogs with her feet together. About 3/4 of the way through the above video, Tanner moves towards the door the instant that the guardian’s hips are pointed away from him. Because of how well both dogs performed, Im guessing it should only take 10-20 practices of this new door answering ritual before the dogs start staying behind the boundary on their own. We finished things up with a little leash training. Georgia was pulling on the leash and Tanner didn’t have the best leash manners when we started out so I pulled out a few Martingale collars. After showing them how to add the special twist to stop the dogs from pulling, we headed out for a short Structured Walk. It was great seeing how well the dogs responded to the Martingale and new leash position. Both guardians mentioned that it was mush more enjoyable walking the dogs without them pulling. If they practice this new walking exercise daily for the next week or two, this should become the new behavior for the dogs on walks. By the end of the session, Georgia and Tanner were both more relaxed, were already starting to follow the new rules and seemed to be looking up to the humans for guidance and leadership. Im guessing that after a few weeks, the dogs will calibrate how hard they can play together and the humans will be in a habit of communicating and leading them so that the dog’s respect their authority.